NOW YOU CAN BUY IN BULK!!! Wonderful Bakelite Testing Pads, these are great when you are out shopping, handy to have in your purse. You can test questionable vintage Bakelite pieces with ease, the pad is simply rubbed onto the piece and if a nicotine colored stain appears the test is positive. The only true test for red and black bakelite naturally is the hot water test. 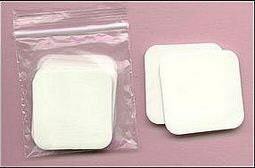 These great little bakelite testing pads can be used over and over, this 2 inch square pad can last a very long time. Each Packet contains 100 PADS! Please note: item processing time 1-2 weeks depending upon payment and stock. I sell these quite quickly in quantity, so sometimes I have to wait a few days for a new order. Thank you for your patience. Regarding shipping, this is a hand cancel, non machinable item so sometimes there is a delay in the shipment as it has to be handled by a human. Also it requires a special trip to the post office, hence the additional shipping charge.